The decision by Greens members of federal parliament to exclude Lee Rhiannon was a disgraceful attack on her, the NSW Greens, internal party democracy and the left in the party. Although the party room, as The Greens MPs call themselves, used the fig-leaf of a local group’s leaflet endorsed by Lee’s office to attack her, the real issue is the NSW Greens’ ability to bind how MPs vote. Greens leader Richard Di Natale and The Greens parliamentarians want to fully embrace parliamentary deal-making and drag the party to the right. Lee Rhiannon and the left in the NSW Greens are regarded as an obstacle to this path. The compromise announced by Richard Di Natale, to establish a pretentiously named “Balance of Power Subcommittee” involving all the other Greens MPs except Lee, does not resolve anything. The subcommittee is simply another way to exclude her from discussions. If there was ever any doubt, the party room’s concern to privilege MPs is graphically exposed by the formation of that committee. And the party room’s request, “that National Council work with Greens NSW to end the practice of NSW MPs being bound”, still stands. The issue in The Greens is not a constitutional one. It is a fundamental question of whether or not The Greens’ membership has control of its MPs and what happens in parliament. The party room has a top-down view of who should control the party. It sees binding MPs as something that makes it impossible for them to operate in parliament. It is a view that puts parliament, not principles, at the centre of politics. Parliament is a ruling class institution and a central cog of the capitalist system. It inevitably exerts conservative pressures on MPs to compromise with the prevailing political establishment. In its early years, before the party had moved so far to the right, the Labor Party membership had similar battles to control its own MPs and insist they implement party policy in parliament, rather than do compromising deals with other parties. Without real accountability to the party membership, MPs are pulled to the right, and bend or break party policies in the name of pragmatism, or as Richard Di Natale puts it, “achieving outcomes”. Never mind that the outcomes might go against party policy. The Greens came very close to supporting Turnbull’s Gonski 2.0 school funding proposal—a proposal that favours private schools. It was the NSW Greens’ opposition to Gonski 2.0 that got in the way of the deal and saved The Greens from a GST moment. The attack on the NSW Greens is just the latest episode in a long-running effort to squeeze out the most left-wing elements of the party in NSW. After last year’s federal election, former Greens leader Bob Brown used the national media to declare, “They need a clean out in NSW”, following a small decrease in the party’s vote. It would seem that the compromise proposed by Richard Di Natale falls short of the SDC resolution. The very existence of the “Balance of Power Subcommittee” is an affront to party democracy. 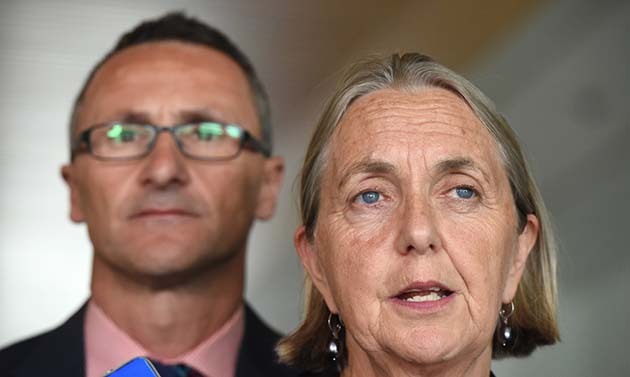 In any case, the next phase of the struggle inside The Greens is going to be played out over the pre-selection of Lee Rhiannon for another term in the Senate. The NSW membership will vote on a candidate by the end of the year. That will be followed a few months later by a pre-selection battle over the left’s David Shoebridge’s NSW upper house seat. There has been wide-ranging support for Rhiannon. Almost 200 NSW Teachers Federation delegates signed a petition supporting her stand. But the right will certainly contest Rhiannon’s (and Shoebridge’s) pre-selections. The right inside the branch has been emboldened by its success in the past two pre-selection contests in NSW. Understanding what is at stake is the first step to mobilising The Greens’ membership and supporters. The future of The Greens as any sort of left-wing party of protest is going to be largely determined by these pre-selection battles. The most left-wing elements of The Greens understand that the real struggles to change the system are outside parliament. Over the coming weeks and months, the left is going to have to fight for that.